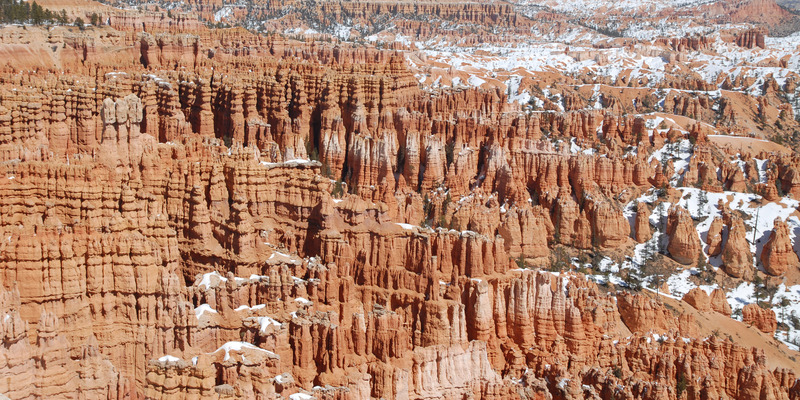 Among the quintet of national parks in Utah, Bryce Canyon is by far its smallest, but don’t let its size deceive you. Its sanguine and curious landscape is a Seussian skyline of sandstone hoodoos, more than 55 square miles ideal for exploration by those whose time is limited. There is a lot to see in Utah, after all. Within a day, visitors can move from striking hoodoo viewpoints into the hoodoos themselves, descending from the canyon walls into the great Bryce Amphitheater itself and back again with plenty of time for dinner and a drink back at your lodge, hotel or camp. Silent City and its dizzying array of hoodoos seen from Inspiration Point. Tyson Gillard. Oriented north-south in a long strip, anchored by Bryce Canyon Scenic Drive and no more than a few miles wide in places, visitors to Bryce Canyon National Park have vehicle access to all of the park’s most scenic hikes and viewpoints. As a stand alone visit or as part of a bigger national parks road trip in Utah, Bryce is a must-see destination for its geologic curiosities and other-worldly scenery. Second in visitation within Utah's national parks, the majority of Bryce's 1.5 million visitors come through between May and September. Consider reserving the middle of the week for a visit to Bryce or the off-season to beat the crowds. Regardless of where and when you adventure, Bryce Canyon is a geologic wonder on par with anything else you’ll experience in the desert southwest. Whether you're staying at a lodge or a local hotel, or staying in one of the park's two campgrounds, we recommended first getting oriented at the park visitor center. Drop in to talk to a park ranger about park conditions, wildlife spotting, and any attractions that vary by time of year. 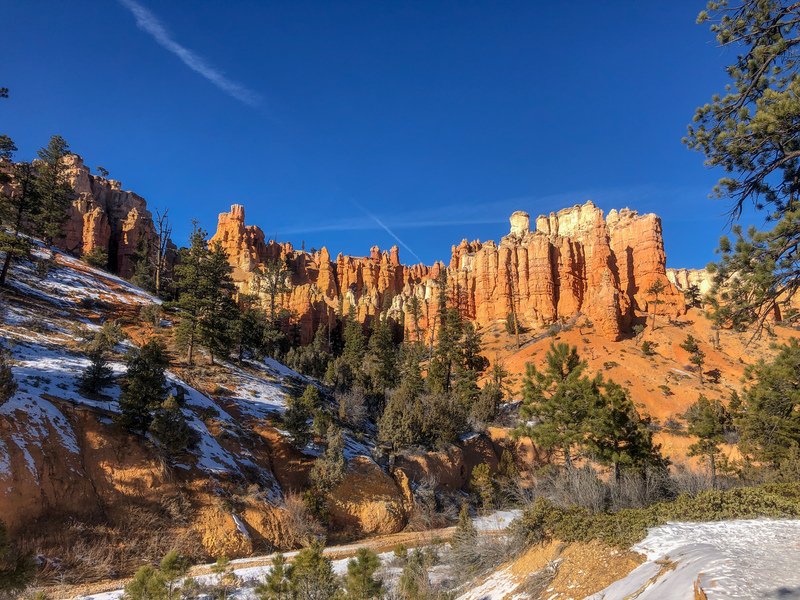 Due to its higher elevation, winter and early spring can bring snowfall to Bryce Canyon, which adds an additional blanket of beauty to an already picturesque landscape, but can also result in trail closures due to unsafe hiking conditions. Make sure to check trail closures if visiting after a recent snowfall. Many of the park's iconic features can be seen from Inspiration Point. Mr. Tyson Gillard. Bryce Canyon encourages its visitors to leave cars outside of the park, and in keeping with accessibility the park has a highly developed public transit system that remains free and open to anyone who pays the entry fee. Enough driving for you—pack your lunch and take advantage of the shuttle to one of Bryce Canyon's most popular and breathtaking overlooks. Inspiration Point is an ideal first stop to orient yourself to the Amphitheater’s most notable features, like Silent City, Thor’s Hammer, Wall Street, the Queen’s Garden, and Wall of Windows to the south. Take a moment to ponder the expanse of geologic time over pickles and a peanut butter and jelly sandwich. Then point to the part of the Amphitheater you want to see up close. Bisecting the Rim Trail, most of these features are a short walk away from Inspiration Point, and all of them are interconnected. Head south 1.5 miles along the Rim Trail to Bryce Point, and if feeling invigorated and energized loop north along the Peekaboo Loop for 3 miles into the heart of the hoodoos and wherever your heart desires most. Atop the canyon rim, the restaurant at Bryce Canyon Lodge is one of the best serving the Bryce Canyon area. Unfortunately, it doesn’t overlook the amphitheater, but those views are just a 5-minute walk away if you want them. Open for breakfast, lunch, and dinner in a rustic dining hall, the restaurant offers fresh, sustainably sourced food that hits the spot after a long afternoon in the amphitheater. After dinner, consider a star-gazing session. Once the sun drops below the horizon, Bryce Canyon’s starry skies erupt under the veil of darkness. Times and locations vary (another reason to check in at the visitor center), but Bryce Canyon’s night programs include full-moon hikes and astronomy tours. The full-moon hikes are very popular and use a lottery system to award admission. Tickets are free. Park rangers also direct an astronomy program, complete with a presentation of the night sky and telescopes to peer into the depths of the universe. The sunrise seen from Bryce Point. Imagine what millions of years of crimson-colored geologic time would feel like with an egg breakfast. Aaron Shady. 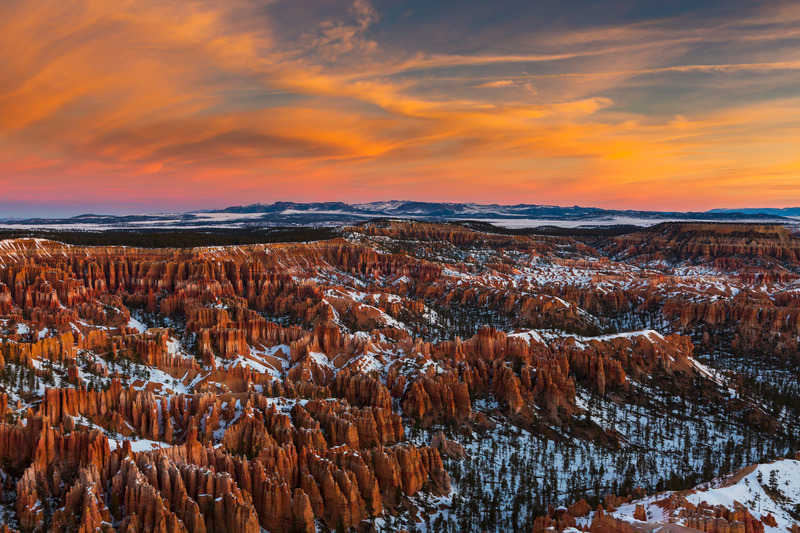 No trip to Bryce is complete without a sunrise at one of its overlooks. Inspiration Point and others are wonderful overlooks, but pack your stove, breakfast and coffee and head to Bryce Point. This is the park’s only overlook that faces north instead of east. Instead of squinting into the sunrise, the day’s first light bathes the Amphitheater in perpendicular light, full of stark contrasts and staggering colors. Take your camera and snap a few photos over a hot meal. 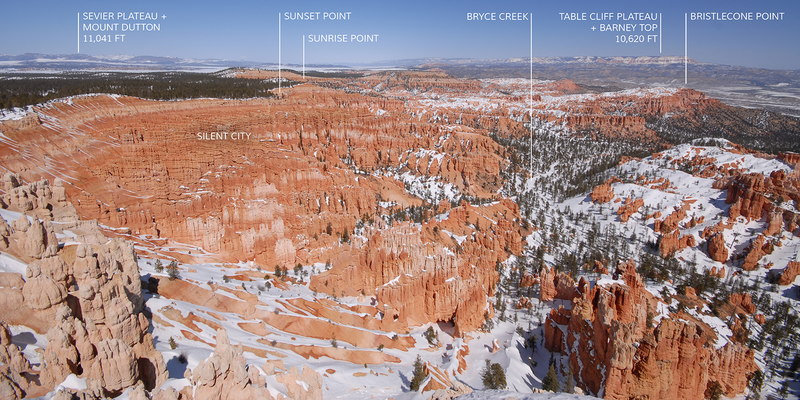 Like most national parks, Bryce offers ranger-guided programs. Specific offerings vary depending on the time of year, but they include geology talks, full-moon hikes, astronomy programs, and snowshoe hikes in the winter—more on these later today. All are great opportunities to learn from experts in a rugged environment. Bryce’s geology alone is worth the time. Bryce Canyon is the last step on top of Grand Staircase, a stepwise ascent through geologic time that starts at the Grand Canyon, and its geology is unlike any of the other parks below it. Most importantly, Bryce Canyon is not a true canyon. Rather than being formed by flowing water, its hoodoos are created through a repetitive cycle of freezing and thawing called frost wedging. At night, when temperatures drop below freezing, water expands with a force of 2,000 pounds per square inch, chiseling away the soft rock of Bryce Canyon. Some rock wears away faster than others, and those capped in dolomite become the hoodoos that populate the amphitheater over the course of millions of years. Boat Mesa, a prominent feature along the Fairyland Route. Jessica Beauchemin. 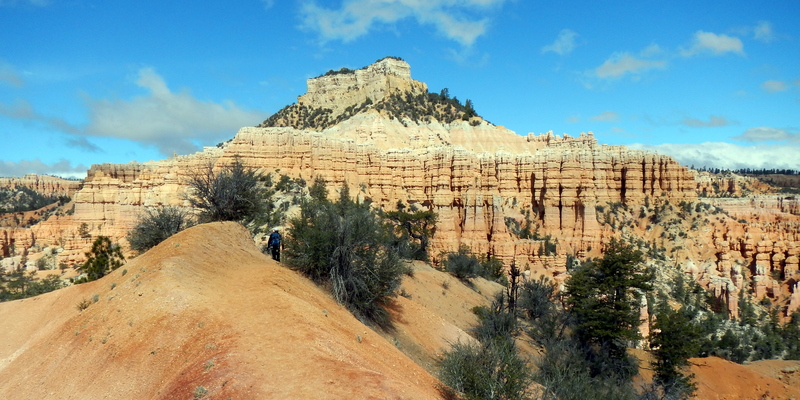 Clocking in at 8 miles, Fairyland Loop is one of Bryce Canyon’s longer trails. Depending on fitness and desired pace, you might give yourself the better part of the day for this hike, starting earlier. Descending north into Fairyland Canyon, it showcases lesser visited features of the Amphitheater, like Natural Bridge, a rock arch formed by frost wedging. Along the way, you’ll see a sparse forest of juniper, piñon pine, and manzanita dot the sandstone slopes amid pronghorn on the China Wall. No shuttles stop at Fairyland Point, so start your hike at Sunrise Point and head northeast, returning via the Rim Trail. If you have an extra day to explore Bryce Canyon, or are looking for alternates to the above, consider exploring the park’s southern reaches. While most of the southern half is best for backcountry camping—you’ll have to come back for that—there are nine viewpoints south of Sunset Campground. Take a victory lap before you leave and find your favorites. At the end of Tropic Ditch, Mossy Cave features a rare sight: year-round mosses and icicles in the winter. David Kerruish. Water is an exceedingly rare feature in the desert of the southwest, and moss is even more rare. You can find both on a short hike less than a mile long at Mossy Cave. Inside a quizzical spring-fed cave, mosses grow year round, and icicles form in the winter. This odd paradox of environments highlights a hike that also features Turret Arch and Little Window along one of the few trails in Bryce that doesn’t enter the main Amphitheater. If you have the time and interest, or looking to escape Bryce's crowds, consider a side trip to Red Canyon. Most visitors to Bryce Canyon drive right by Red Canyon via Highway 12. With similar geology to Bryce Canyon, the trails of Red Canyon feature intriguing hoodoos, colorful canyons and breathtaking vistas that are worthy of attention. Arches Trail is an easy, short hike and great introduction to the area. Within Bryce Canyon National Park itself, those in search of a night of shuteye will find two campgrounds, North Campground and Sunset Campground (note North Campground is more centrally located and the only campground open from mid-October to mid-April) and the historic Bryce Canyon Lodge. For other standard lodging options in the area, visit Garfield County's Bryce Canyon Country Lodging guide. Garfield County is located in southern Utah and provides access to nearly a dozen national/state park and forest areas, including Bryce Canyon, Canyonlands and Capitol Reef national parks. Visitors enjoy epic road trips while exploring Scenic Byways 12 and 143—highways so spectacular they’ve been recognized by the Federal Highway Administration for their one-of-a-kind features. The area is only an hour drive to a commercial airport and four hours from either Las Vegas or Salt Lake City. To plan your own world-class vacation, visit brycecanyoncountry.com or call the Garfield County Tourism Office, at 800-444-6689.